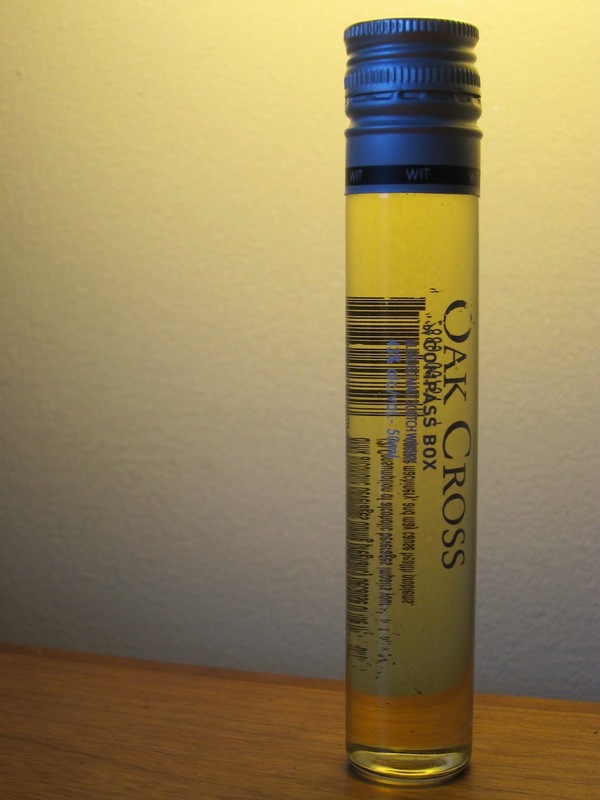 Oak Cross (43.0%): Although it is one of my go to whiskies of all time, somehow I didn't cover Oak Cross on tire-bouchon till now. Let's take care of it tonight... It is a blended malt from Compass Box's permanent signature range containing malts from Clynelish, Teaninich and Dailuaine distilleries which are already aged in ex-bourbon and ex-sherry casks separately. Then they got married together and 60% of the vat goes to new first fill ex-bourbon barrels and (here it gets tricky...) 40% of it goes into some special ex-bourbon barrels fitted with new French oak heads. 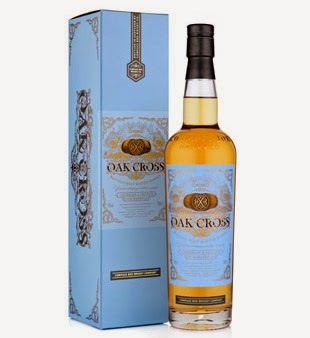 After this final maturation period they got blended together again finally to create Oak Cross. The whisky is bottled at 43% abv, un-chill filtered and doesn't include any caramel coloring. Color: Oaked Chardonnay, light yellow gold. Nose: Cold apple compote, underripe Bartlett pears and fresh lavender. Lemon zest, Riesling wine and vanilla extract. Shortbread cookies, bubblegum and kumquat. Soft oak aromas. A few drops of water brought some serious sweetness: Banana cream pie and lemon bars. Palate: Malt, Gala apples, Irish Spring soap bar and mild dry sherry. Cinnamon, chrysanthemum, cold sweetened chamomile tea, white pepper dusting and some young alcohol burn. Water has the same effect like at the nose: watered down maple syrup, berry wine and vanilla cake. Finish: Warming mouth feel with milk chocolate and Irish coffee notes. Overall: Exactly like I remember: A great go to whisky... When you are looking for a dram to go with your every day pint (probably light in color) at a bar counter while watching football (and I mean soccer here...) on TV, when you cannot decide what to pour after you come back from work before you start prepping your dinner or when you want to have an easygoing whisky on a summer weekend afternoon while leafing through a travel magazine and dreaming of your next vacation. The Wikipedia definition of an everyday whisky. Easy going, yummy and pretty affordable. Almost (yeah, almost...) regret-free when you end up with an empty bottle before midnight... Thanks to Robin Robinson for the official sample and hats off again to the true wizard of modern times, John Glaser.